Bed bugs are elusive creatures, often found in mattresses and box springs, behind headboards, inside switch plates in couch cushions or in furniture seams. They are excellent “hitchhikers.” By hiding in clothing, they inadvertently go along for a ride to a new location, leading to their spreading. Thought to be introduced with early colonists, bed bugs re-surged about ten years ago in hotels and homes. It was attributed to increased international travel in addition to their ability to build up resistance to insecticides. 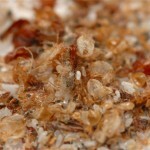 Bed bugs can be found anywhere there are people, particularly in areas with large populations. They have been reported in apartments, hotels, schools, retail stores, single-family homes and multi-family homes among others. Even five star hotels are susceptible to these pesky critters. Bed bugs are becoming a huge problem. Fact is they are becoming more a reality than media hype. It is important to protect your home and your business. They’re great at hiding and have been known to hitchhike in luggage, personal belongings or even you. Once indoors, they can be very difficult to control without the help of an experienced pest specialist. You can reduce your chances of a costly bed bug infestation by catching them early. Bed bugs can multiply quickly, so early detection is critical to help prevent an even larger infestation. Bed bugs are sneaky and hard to find, but your Texas Bug Team is trained to pinpoint evidence if they are around. On the first visit, he will examine your entire home including the bed, furniture, rugs, and linens. He will conduct an inspection of target areas, and if required, use tools to check cracks and crevices. If the inspection confirms an infestation, your Texas Bug Team will recommend a treatment plan based on the severity of the infestation and your preferences. He will use the best tools and science to address the causes and treat your bed bug problem in the best way for your family, pets, and the environment. 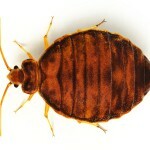 Multiple service visits may be required to eliminate bed bug infestations.